Good morning, dear readers, and happy hump day! For today's blog post, I wanted to share with you the Lyn B Designs nail polish created for the upcoming October Polish Pickup. The theme for this month is Monsters & Mythical Creatures. 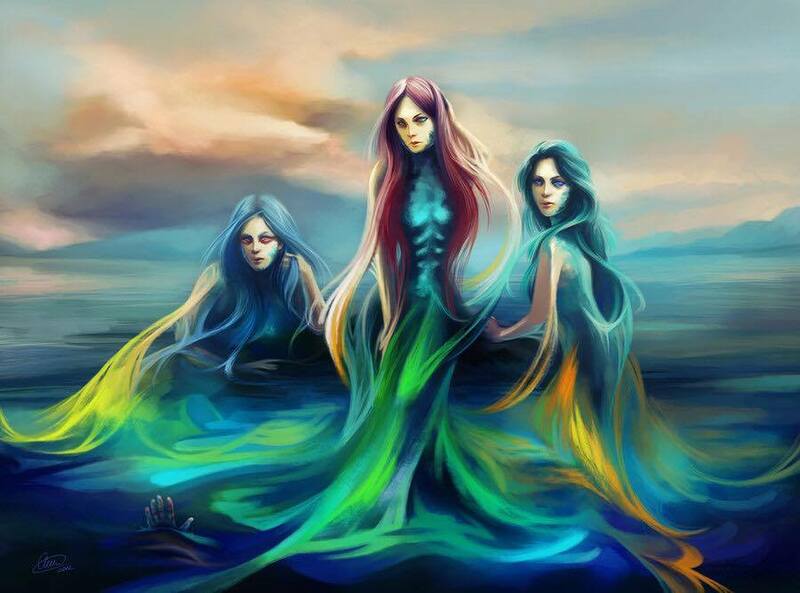 Jenna was inspired by Sirens, mythical creatures that would lure sailors to their deaths with their enchanting songs. While you might want to keep your distance, you're going to want to be close to this beauty! Presenting: Siren Song! Jenna has described Siren Song as a polish with a bright sky blue base with aqua shimmer, holo micro shimmer, and chameleon iridescent glitters. The formula is a little on the thicker side, and it did make the application a little trickier than I would have preferred. It still applied without too much trouble although I will be adding a little thinner to my bottle for future use. I have it shown with two coats plus top coat for these photos. I really wanted to see what Siren Song looked like with a matte finish. Check it out below! Siren Song is gorgeous whether you wear it with a shiny or matte top coat! Siren Song and the other polish offerings for the October Polish Pickup will be available for purchase from the Polish Pickup website from October 6th through October 9th. These polishes will only be available during this time frame, so if you want to pick up Siren Song or other shades from the October Monster & Mythical Creatures theme, be sure to get those orders in while you can. Also, please note that orders are made as a preorder; orders will ship between two and three weeks after the shop closes. Will you be picking up any of the polishes being offered for the October Polish Pickup? Is Siren Song on your list? Do you prefer it shiny or matte? I'd love to hear from you! I love a good shiny polish. I think it looks so good with all sorts of outfits and it just looks well manicured to me. I'll have to check this company out. You always have to most gorgeous nails. That is a gorgeous color for a nail polish. That is one of my favorite colors (and I wish I could get my hands on it for my baby shower next weekend). Ooooh I love it matte'd!!! The matte finish makes the glitter pop nicely! Wow, that is a gorgeous polish and I like it matte, as well. Oh wow, this is the best color! I wish I could put stuff on my nails but my daughter wears things like this. OMG - did you draw the picture on the top of the post. That is so cool. I'm waiting for a delivery of LynB polishes. It was so hard to narrow it down and now you entice even more. This shade is so pretty on you! I'm a matte type of gal too so this is really up my street. That is so pretty! I like it with the matte topcoat! That looks an amazing polish! The blue color resonates the siren color. I am currently designing a kids toy for a mythical creatures contest and the colors of the nail Polish are actually a great inspiration. Weird I know but thanks for the inspiration! I definitely think I love it matte! What a great pick! All the yes to this matte!! Oh my goodness! That color is stunning! I love the glitter! Oh love this! What a gorgeous shade. The glitter looks so pretty too. Those sparkles are to die for. I ADORE the theme you chose. That's so pretty! Reminds me of Frozen. The matte effect is so interesting! It looks like jellyfish in water. That inspiration photo was kind of creepy. I dig the outcome! Ohhhh. This is super pretty! My cousin is a nail polish addict and would absolutely LOVE to add this to her collection! Such a gorgeous blue! I would never think to apply a matte topcoat over a glitter/holo polish, but it does look really cool! Such a lovely sparkling polish! Such a perfect blue for October. I love a good polish! Anything that sparkles you can pretty much sign me up for! Will have to check them out! This is so dreamy. Definitely looks like bubbles in water! Yea I would feel like a mystical mermaid with these polishes.